Players of our Special Edition may rejoice – we’ve fully populated the quest content for the Goat Glade, rewards and all! The trio of multi-dungeon campaigns on offer are fiendish, varied and fiendish (while also being a little fiendish) guaranteeing hours ‘n hours of entertainment for even the most hardened veterans. We’ll be listening to feedback carefully over the next few weeks, so if you have interesting / depressing / ferocious experiences within the Goat Glade challenges, please let us know about them! The game continues to be prettied up in several areas — you’ll notice the shiny nature of the new Codex tabs, and there’s a bunch of cool little animations to help stat comprehension and juice up everyday dungeon experiences more. And while on the matter of the Codex – we’ve already taken some of the minor tweaks and adjustments into consideration, and will be adding more content (especially in boss and lore areas) in the coming weeks. Should be great! Bugs are, of course, still being squashed on a day-to-day basis. They’re frisky little rabbits, no? Fixed a crash in the codex. Removed challenge icons from monster class codex entries. Fixed the flickering on item effects in the codex. Codex now saves settings/entry changes on closing. 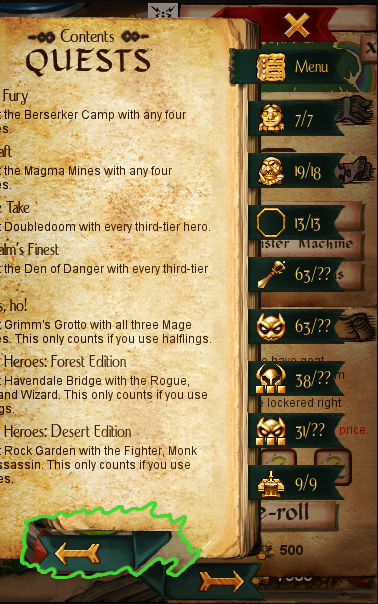 Added achieveable/got/failed icons to badges/quests in menu. Fixed coloration bug in prep list on adventuring permit. Added more stat update animations. Prevented stat update spam at player spawn. Set race portraits in codex to use random class/gender. Set class portraits in codex to use random gender. Fixed a bug where tutorial 4 was not awarding gold. Added more polish to codex navigation. Added text to bank describing why veto/locker slots may not be purchasable yet. Gave the ‘death’ glow a fall-off, that remains more subtle. New Goat Glade triple quests added! Piety trails added on earning piety.